It looks as if it is going to be a long session for Iraq’s parliament today, so here are some initial reflections on the reported vote by parliament to approve 8 out of 9 new members of the country’s independent electoral commission (IHEC). All that follows is based on the assumption that initial press reports about the vote and the identity of the new councilors are correct. The official parliamentary report is due later today and should be taken as the final word. For many weeks, the battlefront regarding the make-up of the new electoral commission board has concerned its size. The decision last week to keep the current size of the board (9 members) was seen as a setback for Prime Minister Nuri al-Maliki, who had apparently hoped to expand the board to 15 with the aim of diluting the political influence of his enemies. It can be worthwhile, therefore, to begin with a brief look at the political composition of the new board and compare it to the old one. Most reports suggest that of the 8 new commissioners, 4 are from the Shiite alliance (two from Daawa, one from ISCI, one from the Sadrists), two are from the secular and increasingly Sunni-backed Iraqiyya and two are from the Kurdistan alliance. There is an unresolved question as to whether a final ninth member of the commission, supposedly a minority representative, will be a Turkmen or a Christian. Compare this with the previous IHEC, which pre-dated Maliki’s rise to power. It also had 4 Shiite Islamists, but only 1 was considered close to Maliki – the rest being closer to ISCI, Fadila and the Sadrists respectively. 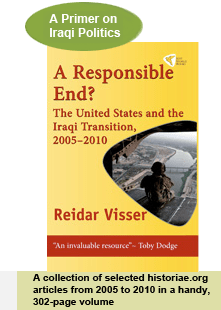 There were 2 Kurds (same as today), but Iraqiyya had only one commissioner close to them, the two remaining members of the board originally having been considered close to the Shiite Islamist Tawafuq alliance. On the balance, then, Maliki has apparently seen his position improve slightly, but not a lot. The ISCI-Iraqiyya-Kurdish-Sadrist alliance that threatened him earlier this year commands perhaps as many as 6 seats on the new board. It makes you understand why Maliki had wanted 15 commissioners instead, ideally with some space for his newfound allies in the smaller parliamentary blocs among the Kurdish opposition and the Iraqiyya splinter groups. Today, there were even reports that members of the second branch of Maliki’s Daawa party, the Tanzim al-Iraq faction, were unhappy that the mainline Daawa had monopolized two commissioner seats for the State of Law coalition to which they both belong. Every little will count, in other words, so it will be interesting to see who the ninth commissioner will be, whether Turkmen or Christian. One Iraqiyya spokesman has already said he is in favour of the Turkmen female candidate, Gulshan Kamal. It should be added in this respect that there is no legal or constitutional requirement that any sect be represented. The IHEC law from 2007 only stipulates that there should be at least 2 lawyers on the board, that the rest should be “experts” in electoral affairs, that they should be politically independent, and that the representation of women should be taken into regard. It seems the female representation requirement has been given only a very symbolic nod today (in the possible ninth seat for a Turkmen female). The political “independence” criterion hasn’t been taken seriously at any point since the IHEC law was passed. From the legal point of view, perhaps the most glaring question is whether a parliament vote on 8 members is valid when 9 are called for by the law. In any case, attention will now turn to the local elections scheduled for 2013. Perhaps those elections, in turn, can produce some new alliances that can help breathe life into Iraq’s stalemated politics. Iraqi parliamentary politics briefly got exciting again on Thursday, as one of the first contested votes in a long time divided the chamber along interesting lines. Contested votes are comparatively rare in Iraqi politics. Usually, bills never come up for a vote until the political leaders have ruminated on them for so long that consensus is achieved through sheer exhaustion (or, not infrequently, by watering down the bills to the point where they are meaningless and/or contradictive and hence acceptable). Dissent is often marginal and not taken note of at all: Parliamentary records typically include a notice to the effect that this or that bill passed with a “majority”. Usually, this will have meant that the chamber – rarely more than two thirds full even on the best of days – will have passed the bill with a solid margin of maybe 80 or 90% of deputies voting in favour. For this reason, the comparatively rare contested votes in the Iraqi parliament tend to receive attention. Memorable past ones include the cliffhanger vote on the law for forming federal regions in October 2006, the battle over the provincial elections law in 2008, and the fight over a new parliamentary speaker in the first part of 2009. Interestingly, most of those votes to some extent touched on disputes relating to fundamental issues of state structure, with the Kurds and advocates of stronger centralization siding with opposite camps on all three occasions. Yesterday’s developments in parliament belong to the long-running saga of installing a new electoral commission for Iraq (IHEC). In fact, that process has already seen one contested vote last year, when Prime Minister Nuri al-Maliki tried to sack the existing board but lost the vote in parliament. The term of the current IHEC board has now expired and it survives only through monthly extensions of its mandate granted by parliament in lieu of agreement on a new board. The big decisions relate to how many seats the board will have (there are currently nine commissioners) and who should fill them. In this dispute, Maliki has identified himself with a proposal to extend the number of commissioners from 9 to 15. Presumably, the thinking behind this is that a big commission could be more susceptible to divide and rule strategies, and Maliki is probably also eager to find seats on the commission for newfound friends of his in splinter groups from the secular Iraqiyya and the Kurds (Goran). Maliki allies have said openly that they fear a 9-person board would have a too strong pro-Iraqiyya contingent (maybe 3 commissioners). A law featuring proposed changes to the existing law for the electoral board – including the Maliki-sponsored increase of the number of commissioner – has been making its way forward in the Iraqi parliament and yesterday was ready for a vote. However, instead of adopting the changes, parliament voted to cancel the proposed changes. This is where the political dimension comes into play. The official parliamentary record says 233 deputies were present when parliament opened. Press accounts say pro-Maliki deputies from his own State of Law coalition, White (Iraqiyya breakaway group), Fadila and Goran (Kurdish opposition party) left the chamber in protest, leaving deputies from Iraqiyya, the Kurdistan Alliance, ISCI and the Sadrists to vote down the changes. Just to complicate matters further, there are two accounts of how many MPs were present during the contested vote: Parliament speaker Nujayfi of Iraqiyya says 169 deputies were in the chamber (above the quorum level at 163); Maliki ally Khalid al-Atiyya says there were 156 deputies (less than the required quorum). Whichever interpretation is correct, the vote yesterday should serve as another wakeup call for Maliki with respect to his narrow support base in parliament. Essentially, the forces who threw out his attempt to increase the number of IHEC commissioners were the same that tried to unseat him earlier this spring. Even though Maliki appears to have made some progress in drawing parts of Iraqiyya closer to him than to their nominal leader, Ayyad Allawi, this is of limited consequence unless he can get them to vote with him in key parliamentary contests like this one. Earlier this week, Allawi – who is technically a deputy but who rarely visits the national assembly – appeared briefly at the parliament building to discuss with the components of the Iraqiyya alliance. Allawi will likely see this latest vote as something of a vindication after a rather bumpy ride and multiple Iraqiyya defections during the first half of 2012. Absent any supreme court challenges regarding the quorum, the debate about IHEC is now likely to focus on the identity of the 9 commissioners. The legal requirement that they be independent from party politics has long been forgotten, across the board.